What lies out of sight of Val'Qurico, Mexico. We headed out one morning on a road trip through the mountains and into the state of Puebla. 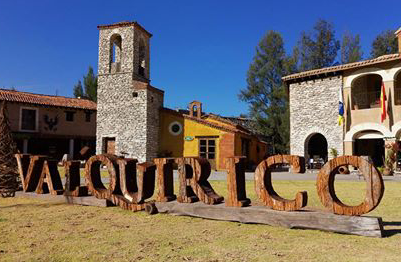 We had quite a lot on our list to visit, one place being the hacienda-turned-tourist hotspot Val’Qurico. The former hacienda is now under construction for an expansion and includes a beautiful public square with restaurants and all manner of tourist attractions. As we were driving into Val’Qurico we approached a bridge and were hit with an incredible smell. It felt as though the inside of my nose was sunburned and my mouth immediately tasted metallic. I could think of nothing else to do but blow air furiously out of my nose and take a sip of water to rinse out my mouth. We all looked around in the car and my husband yelled out “look, look at the river, the smell is from the river.” We peeked out of the car window and saw a sight I have never seen before. A fast flowing river under the bridge turned a milky grey color from pollution. The smell only intensified as we got closer and I found myself holding my breath as to not breathe the toxic air. The metal and feces infused smell faded as we departed the bridge and rounded the corner. We arrived shortly after at Val’Qurico and needless to say I was completely incapable of enjoying myself at the hacienda. During my entire visit my mind was on that river, how it got to be that way, how it can be fixed. Atoyac river, the milky grey color is from pollution. I wish smell-o-vision existed. After spending nearly my entire collegiate life studying biology and then later dedicating to environmental science I had only read about the level of pollution experienced here. We studied numerous case studies of extremely polluted rivers and lakes that caused protests and uprisings across the globe. They were almost always success stories, resulting in lawsuits, government oversight, and later cleanup of the water resources. Years down the line you can study progress pictures as the landscape is restored to its pre-pollution levels and nature comes back to stay. We had to study these cases because, in my naivete, I assumed that those levels of pollution did not exist anymore in the world. We had moved past that. Companies simply don’t release raw industrial waste into rivers anymore. We have proven time and time again that not only is it morally wrong and unethical, it is dangerous to human health. There is a reason this river causes you to gag burning your nose and throat, it is full of volatile organic compounds that have been known cause cancer and damage your mucous membranes. This information is not new. Yet, here we are, 2018 and there is a river full of raw industrial effluent flowing through farmlands, towns, and a city of 2.5 million people, Puebla Mexico. I do not need to go into a diatribe about the level of government corruption that must exist in all branches for this to have continued for so long. You probably figured that out on your own. Corruption, lack of education and silencing anyone who speaks out is a recipe for complete disaster. The very worst part about all of this is that the water from the Atoyac river is used for farming and drinking. A public resource that people rely on for their livelihood is polluted beyond use, yet people have no other option. I wish I could do something about this. I wish I could do anything at all. Scientists have been studying the Atoyac, calling on their government to do something, and yet we are still here. If anything, I hope that it allows all of us to reflect on what we currently have. How lucky we are. People have been working in the United States for decades to protect our natural resources from blatant misuse like this. It took a river to catch on fire in Chicago before something happened but it was the catalyst that we needed to get going. This is a excellent opportunity to look around at the nearest creek, river or forest in your neighborhood and be thankful for how much work it took to protect it. The United States is at a point in our environmental protection that we are moving past pollution that we can see and smell, and entering into a world of trying to regulate unseen contamination. 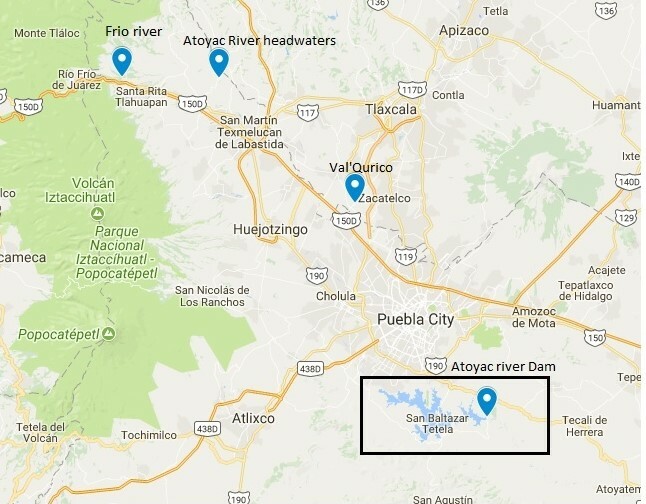 We can begin to question pollutants that seem severely less harmful than those in the Atoyac river. Looking at the Atoyac it is hard to understand why people are making such a fuss over carbon dioxide and fertilizer runoff. However, we are privileged that these are the problems we face and not the alternative. Just because we have come this far and achieved so much does not mean we are finished. The reservoir circled on the map was listed as "devoid of wildlife". The only animal sightings in the area were rats.